If you’re looking for great places to eat in Cebu, then you should check out and follow #CebuFoodCrawl on social media. When you do, you’ll see all the delicious restaurants, cafe and other must-eat places in Cebu. #CebuFoodCrawl started in 2015, and is now on its fourth year as #CebuFoodCrawl2018 happens on November 30 to December 3. Get ready to follow twenty-five (25) bloggers from all over the country around Cebu as they experience the best that the city has to offer when it comes to food. 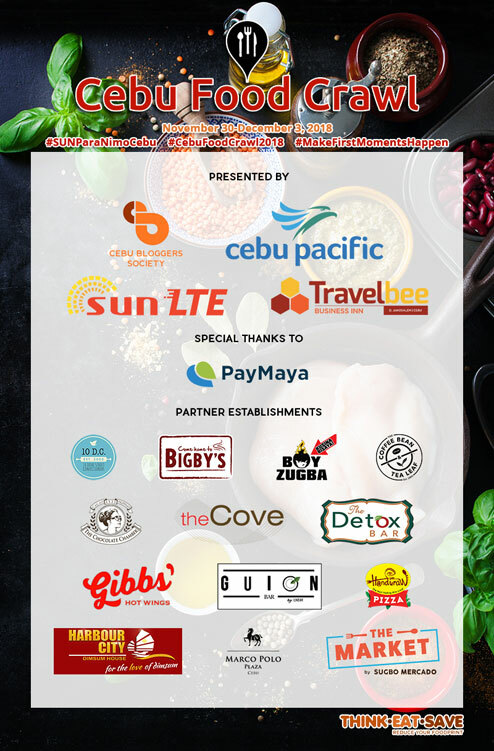 This year’s Cebu Food Crawl is organized by the Cebu Bloggers Society and co-presented by SUN LTE (official network), Cebu Pacific Air (official airline), and TravelBee Business Inn (official residence). It is also supported by PayMaya and Grab. The four-day event supports the Zero Food Waste advocacy in-line with the theme “Sustainable Dining“. 10 Dove Street Confectionery – must-try cakes, pastries and other tasty treats!